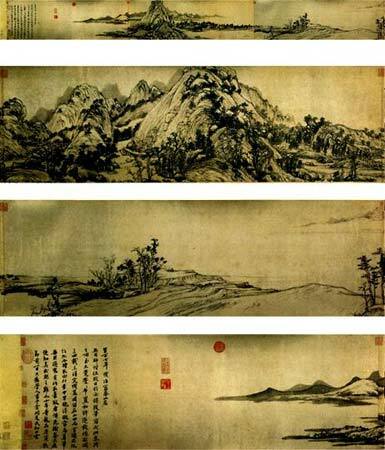 Chinese paintings use ink, brush and colour pigment to draw on silk or rice paper. This is very different to the Western paintings. During the Beijing Olympics ceremonies in 2008, you probably have seen the breath-taking scenes of opening a scroll of pictures. I have no doubt it was inspired by the traditional Chinese paintings and calligraphies. 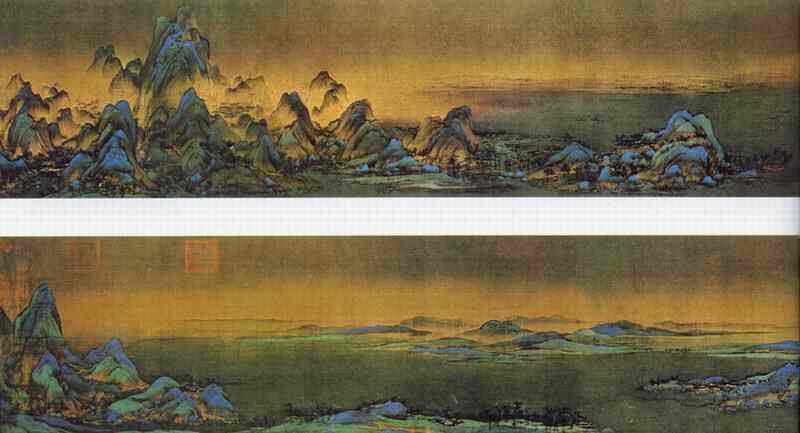 Some of the top 10 famous Chinese Paintings below are indeed big but with delicate details. Luo Shen Poem 洛神赋was written by the famous poet and calligrapher Cao Zhi 曹植during 192-232 A.D. Son of the famous general and later King of Wei (one of the 3 small countries before China was united) Cao Cao 曹操, Cao Zhi was a renowned poet at his time. In the Luo Shen Poem, Cao Zhi described his love for the Goddess (Shen) from the river Luo – how beautiful she was and how frustrated that his love for her could not be fulfilled since she’s not from this earth. 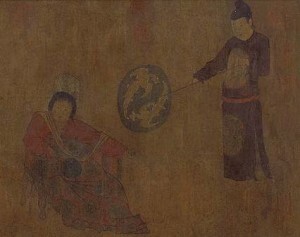 It was believed that Cao Zhi was showing his struggles in a relationship with a married woman in the poem. The romance of this love beyond reach was captured by the painter Gù Kǎi​zhī​. 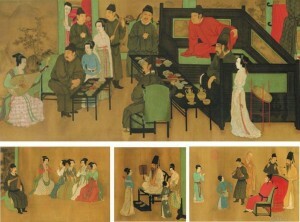 The painting was based on a historical fact about the marriage between Princess Wen Cheng in China to the King of Tibet. 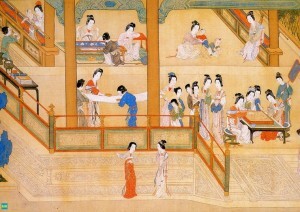 Sitting in the Emperor’s carriage was the father of Princess Wen Cheng Emperor Taizong of Tang Dynasty. The story goes that there were 5 countries who proposed to Emperor Taizong wanting to marry his beautiful daughter. 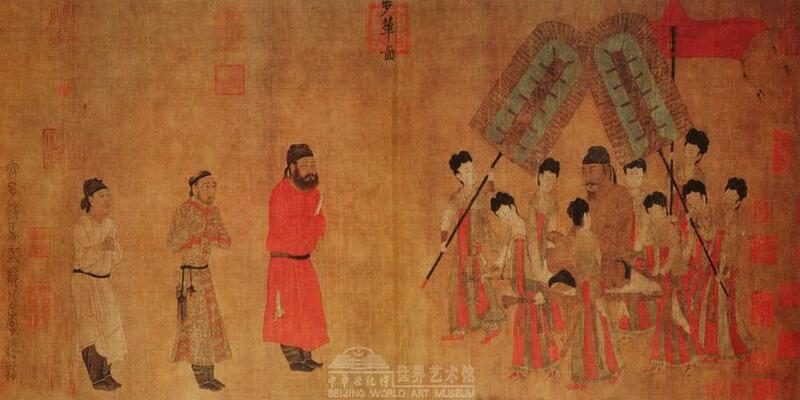 In order not to upset anyone, Emperor Taizong requested all the ambassadors who came to propose to sit in a test. In the end, it was Tibet who won. So Princess Wen Cheng then moved to Tibet and became their queen. The cross-culture marriage started even then! When Princess Wen Cheng moved to Tibet, her dowry included Buddha statues, jade and gold jewelleries, 36 classic rolls of books, different types of cooking ingredients, brocade fabrics, 300 books about god and fate, right and wrong, 60 books about manufacturing and engineering, 100 Chinese medicine recipes, 4 types of medical books, 5 types of medical treatment methods, 6 types of medical machines and many different types of seeds. It was a big troupe. 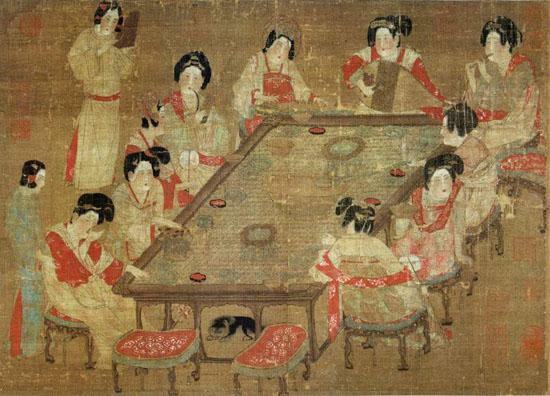 Listed in the Top 10 Famous Chinese Paintings are a series of paintings of beautiful women by 2 painters. 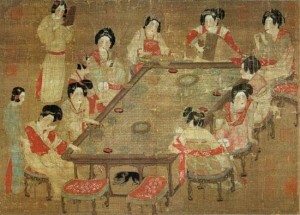 Painting beautiful women had a long history in China. These series of paintings were the portraits of the beautiful women who are from the Royalties in the Tang Dynasty. From their beautiful faces, readers can have some indications of their life. Although wearing very beautiful clothes, some of them had no smiles. Also, “Rounded and plump” was the beauty standard in Tang Dynasty. It’s clearly portrayed in these pictures (even although Westerners may not necessarily agree!). 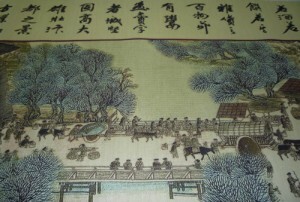 An oxen is a very important symbolism of energy and hard work in the farming life of whole of China. The 5 cattles portrayed here have different demeanour. It had been a popular private collection item for years before the Chinese National Museum got a chance to buy it and became part of their collections. 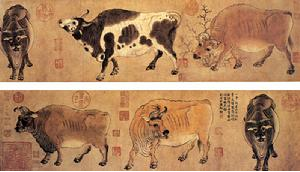 When China celebrated their 60th National Day anniversary, they produced gold coins based on these 5 oxen. 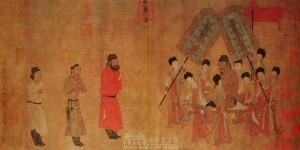 Han Hee-set was a senior official at the Tang Dynasty. He was notorious for his debauched parties and life style. From the surface of indulgence and excessiveness, sadness was showed in people’s faces. When the painter finished this painting, the artist was only 19. It was immediately recognized as a masterpiece. Unfortunately he died not long after. The painting portrays activities by the banks of River Bian汴 during the 12th Century China. 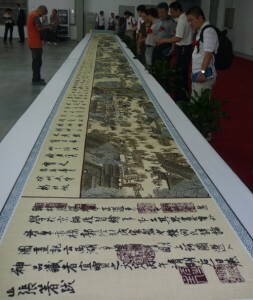 The painting is huge, over 5m long and portrayed more than 500 characters with different clothes and different gestures. River Bian was an important transportation channel. By the 2 sides of the river, there were many commercial activities, which were portrayed in amazing details in the painting. The inspiration of this painting was taken from Fu Chun River in Jijiang. – another renowned painting on mountain and river. One collector loved this painting so much that before he died he ordered it to be burned and be buried with him. Luckily, his niece tried to rescue. But it was damaged and broken into 2 parts. During the Qing Dynasty (1644-1911), Emperor Qianlong was presented with 2 copies of the painting – one fake, one real. But he took the fake one as real and even stamped the royal zeal on it. It was investigated later by professionals and proven that the one that Emperor Qianlong ignored was actually the real one. 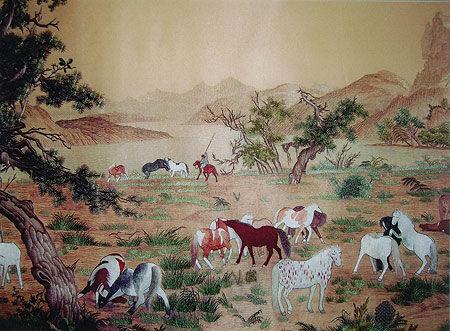 The painting is now collected by Jijiang Museum. A picture to portrait the different activities in early Spring morning inside the Palace including doing make-up, watering the plants, gardening, feeding birds, singing and dancing, playing chess, reading, appreciating paintings, drawing, playing with children, delivering food etc. Giuseppe Castiglione was a missionary, who was a member of the Society of Jesus. He went to live in China and called himself Lang Shih-ning while he was there. Giuseppe served as an artist in the court. Trained as an artist in Italy, Giuseppe combined the techniques of Chinese and Western painting and created a truly East meets West style. Giuseppe spent over 50 years in China and died there. The painting is now collected by New York Metropolitan Museum.